Neighboring Jordan, one of the rare Arab nations with diplomatic relations with Israel, strongly condemned the arson attack on Palestinian homes by suspected Jewish settlers early today in the West Bank village of Duma. 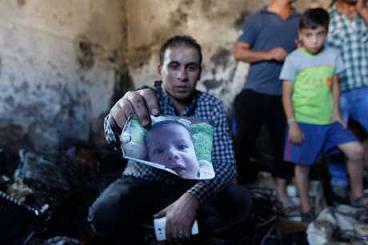 (A relative shows a photo of the 18-month-old Ali Saad Dawabsha, who was killed in an arson attack). “This ugly crime could have been avoided if the Israeli government had not ignored the rights of the Palestinian people and turned its back on peace... in the region,'' government spokesman Mohammed Momani said.